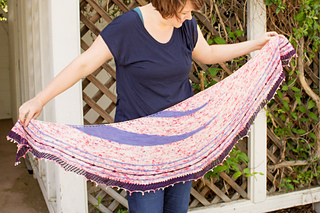 This shawl was designed for the Jimmy Beans Wool exclusive colorway from Lorna’s Laces, “May ’16 – Wildflowers”, as a part of the Mother’s Day Gift Bouquet. 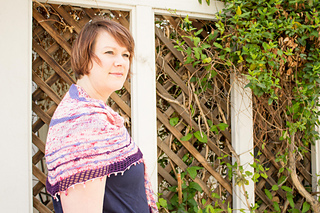 This elegant crescent shawl evokes the night sky, using short rows, gathered stitches, and a mesh border as you continue knitting into space. 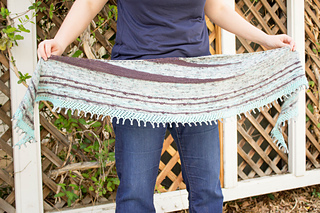 The shawl only uses one skein of yarn and 100 yards of two different colors, making it a great project if you are in need of destashing your yarn bits with a special skein you’ve been dying to use! To purchase a Mothers Day Wildflowers Bouquet kit from Jimmy Beans Wool, click here to go to the page. 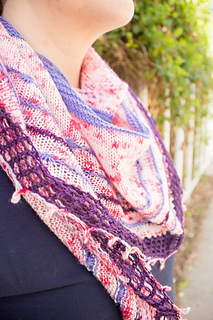 Customers who buy the kit will also recieve a download code for a free pattern download for this shawl. 80” in wingspan and 11” from top to deepest point. 4” = 10 sts and 18 rows. 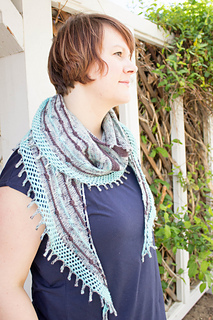 PATTERN NOTES: Read the pattern before casting on to familiarize yourself with the project. 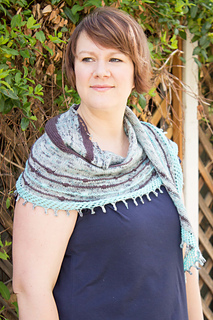 I made this shawl to adapt to the yardage I had at hand, so I did have leftovers of all the yarns, but still check your gauge so you don’t end up playing yarn chicken. There is no right or wrong answer to which mini skein to use first, so do what looks best to you.